The other day I posted the photo above and talked for a millisecond info on my little bathroom project. That night B hung the shelves for me and set them all up while I was downstairs in the kitchen. I was so excited when I walked up the stairs and saw everything off the counter and on the wall! I’m in love with them. You see, I’m lazy. Ask B, he’ll gladly back me up on that. Our counter will go a week without being wiped down if there’s too much stuff on it. Now we can keep everything in these shelves and I can easily wipe down the counter before all those little fuzzy dust hair things start accumulating. You know what I’m talking about! Please know what I’m talking about. Enough talk about my unappealing housekeeping habits. Now, the reveal. Doesn’t it make such a difference? I know you can’t see my counters, but you can see how much stuff isn’t on the counters by all that junk on the shelves, right? Plus that bare wall was killing me. I think the shelves fill the space nicely. Total: Lets say about $10 – I still have a ton of paint left. 1. Build sprice racks. Yes, they come needing assembly. It takes 5 minutes, you can do it! 3. 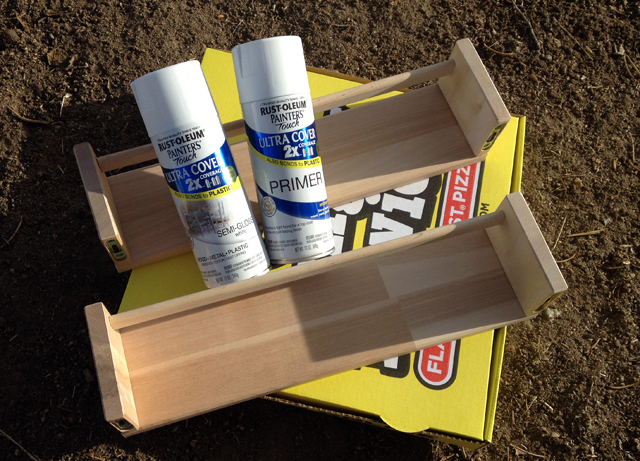 Paint: 2 coats primer and 2 coats paint. Some spots that needed a little more coverage so feel free to touch up as needed. I waited about 30 minutes between each coat and then let it dry for 5-6 hours before we put them up. 4. 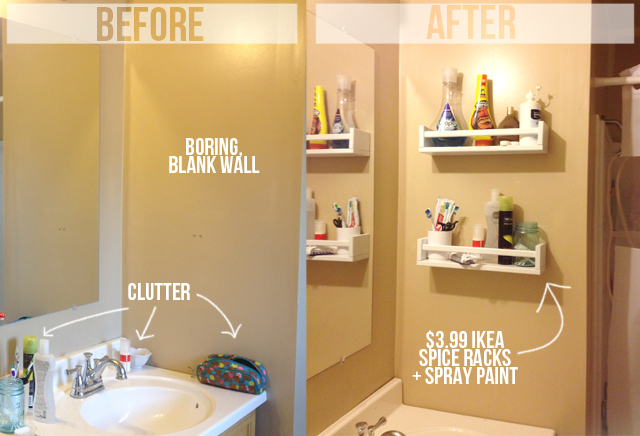 Hang on wall, put all that junk you have on your counter on the shelves + marvel at all the extra counter space you have! As always if you do this I want to see! I’m a little obsessed and might pick up several more next time I’m near an ikea. I can think of a million places I could use them! And I thought I was being original 😉 but yeah we moved 2 hours from the closest ikea and it drives me crazy that you can’t buy a lot of their smaller stuff online. Ug, this is SO smart! I need to do this– my makeup and hair products are always all.over.the place!P.S. I found your blog through Yours Truly, and I will be a new follower! That’s how it was for me too! Definitely do it. It makes the bathroom look so much less cluttered. Thanks for following, Wendy! Looks awesome!. The total looks like it’s nearly $16 though. Yeah, that’s true. But since I used less than 1/4 of the paint and had other plans for the left over paint I kind of subtracted that from it.